I have 2 beauty regrets: not wearing sunscreen and sleeping on my side (okay three--that blue eye shadow did me NO favors when I was younger and thought I looked cool). Because of those two regrets, I developed wrinkles in my chest area (décollete) last year or so. I hate it. It makes my chest look older than I am. Stop sleeping on your side, y'all. I can tell instantly if you are a side sleeper by those wrinkles. My Grandmother, who is in her late 70s, says not to sleep on her side and she has NO wrinkles there to prove it. I wish I had listened to her! My wrinkles made me incredibly self-conscious, so I tried creams and all sorts of things. Nothing worked. 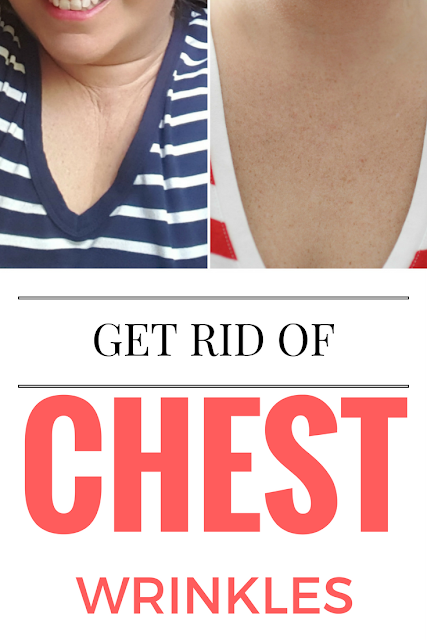 I finally found some solutions that actually worked to get "rid" of chest wrinkles that might interest you (or someone you know). 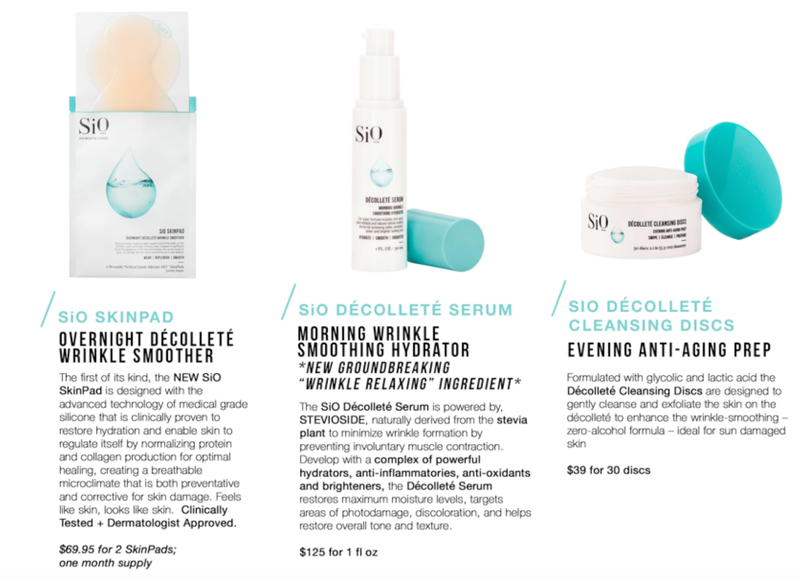 First is the Sio System, which I received for review consideration--it comes with 3 steps: SiO Décolleté Cleansing Discs, SiO SkinPad and SiO Décolleté Serum. Women put so much effort into reducing signs of facial aging, yet fail to tend to the décolleté, which actually ages faster than other areas of the body due to its thinner dermis and lack of collagen density. Cue SiO – the FIRST 24-hour system specifically developed to treat visible signs of aging that affect the décolleté area. You use the cleansing discs, then apply the Sio SkinPad, which you wear overnight, and then after removing the pad in the morning, you apply the serum to rehydrate the skin. The pad can be used over and over for about a month. You get 2 pads in each box. The skin appears smoother and it really looks like the wrinkles are gone. 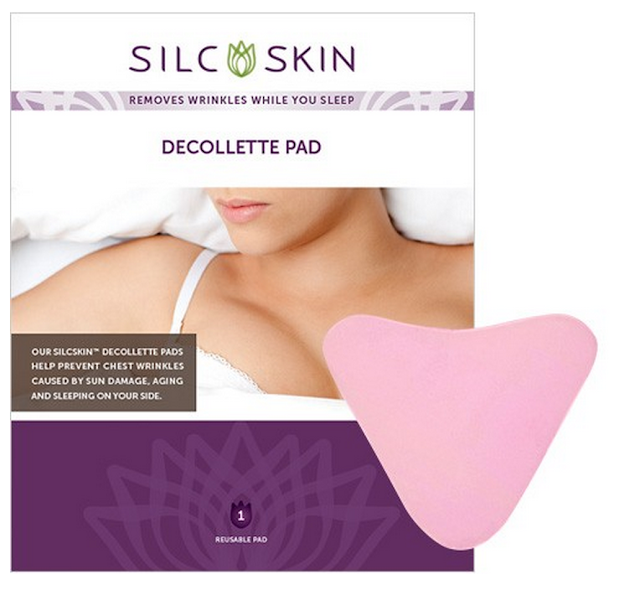 I also tried the Silcskin Decollette pad, which I purchased. This is one pad per pack for $28. While the Sio pad is a bit sturdier, this one is very flexible and very sticky, but a bit more comfortable to wear. The pad is clear--the backing is pink and it is reusable as well. This one seemed to not last as long as the Sio before the stickiness started to wear off. It lasted for about a month before getting losing stickiness. You wear this one overnight and then peel off in the morning. I liked both systems for different reasons, and I really think it depends on your budget and the size of your chest. I think those with larger chests might like the Sio better. However, if you want just one step, the Silcskin might work better for you. 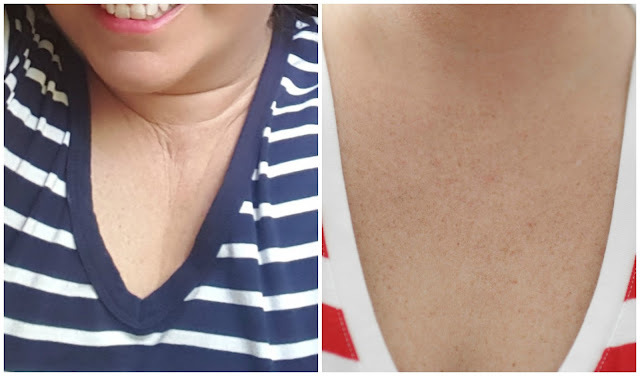 I saw results overnight from wearing trying out these systems, and the results lasted about a month before those lines started creeping back in. I have repurchased them and continue to use them, but have been lazy about using them nightly. I had no reactions to the products. I would recommend either and am glad to have found solutions that worked for me. I'm SO happy to have that confidence back when it comes to wearing v-neck shirts or off-shoulder shirts. Have you heard of these products before? Do you know someone with chest wrinkles? You get wrinkles from sleeping on your side! I just started doing that a few months ago! Well that's stopping. These look great for reducing wrinkles! Can I put them all over my face too?! I didn't know these products were out there. I love that you see immediate results! Such a great post for wrinkles. Thanks for sharing it. I had no idea you could get wrinkles from sleeping on your side! And I sleep on my side every night. I need to change that ASAP! I've never heard of these products, but it looks like they do a great job! Thanks for sharing, Elle! I was asked to review these too but I had to say no because I need to slow down on the PR stuff but told them to keep me in mind for next year. Glad to know that these actually work and not just a gimmick. I hadn't heard of the products but they totally make sense! We all need help and targeted products for our different areas. I had no idea sleeping on your side did that!! I'm going to try to stop doing that! I didn't know about these and may have to try one out. I didn't have a problem until recently when my kids started climbing into bed with us and I was forced to sleep on my side to make room for them. Omg, I had not considered this before- I always bring my face treatments + serums down to my chest + neck, but targeted treatments sound awesome! Gah . . . I'm a sometimes side sleeper! I often notice these wrinkles on myself and others . . . never considered that it was from side sleeping - I'm going to try and do better!!! Too bad that they preach side sleeping during your pregnancy. You are literally not supposed to sleep on your back or stomach. I am more a stomach sleeper and it has been so hard for me to get used to sleeping on my side. I hope I go back after I have the baby because I don't need wrinkles in anymore places, thanks! I didn't know that about side sleeping! I've always slept on my back, so hopefully I stay that way! Those products worked so well! I had no idea that sleeping on your side caused chest wrinkles! Oh my goodness this is an aging issue I've never even thought about before!! No!! Typically I'm a back sleeper but during pregnancy I've had to sleep on my side and I hate it. I feel like my face is always marked up in the morning... but as soon as baby comes I'm going back to my back. And keeping this product in mind if I do get those wrinkles! What a great product! This is something a women like me needs now! :) Thanks for sharing. I have never heard of these products! I have never thought about this issue before and I confess I just looked down my shirt, lol! Thanks, as always for your great tips and reviews! Omg what a difference! I think I'm kind of an all over sleeper but definitely sleep on my side occasionally. Luckily I don't have any wrinkles there yet, but definitely will remember this product if I do! Wow! Interesting... and this comes from someone that always sleep on their side! I am not sure if I can sleep on my back or tummy! Ugh! I haven't developed wrinkles there YET, but this product looks great!! And, GREAT results!!!! This makes me so glad that I have been pretty religious with the sunscreen. I'm so glad this worked for you! Gah, I have those chest wrinkes, too and it seriously looks so bad when I get up in the morning! Definitely need to keep these products in mind. Wow! I am a side sleeper and I think that needs to stop now! But what an incredible difference! These really work well! I did not know that sleeping on your side could cause chest wrinkles. I sometimes sleep on my side and I will need to put a stop to that. At least this offers a solution. Never knew side sleeping cause chest wrinkles. Now you have me wondering if I have chest wrinkles. Okay, okay, you have me convinced. But what do you do besides sleep your side? Back? Stomach? Oh wow! Okay, I didn't realize. Boo. I do like sleeping on my side...! I just started noticing wrinkles there within the past year. I sleep on my right side. I can't sleep on my back since I had an epidoral when I had my daughter. So I'm kind of stuck. I'm most comfy on my side anyway with a pillow between my legs & I pull the sheets over my head to stay warmer & block out light. I would never think about getting wrinkles on my chest, but duh you can wrinkles anywhere. How awesome is that you can get rid of them that fast. Super cool product! I try SO HARD to sleep on my back, and when I wake up in the morning, I'm always on my side! I don't have chest wrinkles yet and I do my very best to lather myself up with rosehip oils every night to reduce signs of wrinkles. Interesting product though! I heard silk pillow cases are great for reducing facial wrinkles. why did we all insist on blue eyeshadow?! it didn't look good on me either lol.